Sleep is a precious commodity when travelling between time-zones. Here’s how to get some. Never pass up a chance to get some shut-eye. When faced with the prospect of a 10+ hour flight, you may plan to watch some movies, perhaps ever write a presentation or finish a project, but if you’re feeling drowsy while the plane taxis to the runaway, don’t fight it. And don't bother with a short-acting sleeping pill; they only work if you're going to lie down flat, so only apply to those in business or first class. Save them for the first night in your destination, and instead follow these simple tips for in-flight kips. It’s perhaps the most obvious way to get some sleep, but most of us fixate on finding the lowest fare possible to the destination we want rather than the time that suits our bodies’ natural rhythms. However, booking a flight that leaves at bedtime is not the answer, because airlines tend to wait a couple of hours before serving drinks, then dinner, then more drinks… and it can be five hours into a flight before it’s possible to sleep. So in a perfect world, try to fly long-haul in early evening. People love the front of the plane because it means disembarking about five minutes before those at the back. For a night flight, that's a poor decision because the front of the plane is usually the busiest and the loudest area of the plane. Families with children tend to congregate there, and flight attendants chat and move about more. If you really want sleep uninterrupted by others, a window seat at the back of the plane – and far away from the engines on the wings – is what to go for. If the person next to you tries to chat, cut them off immediately; inane conversations can otherwise go on for hours. There’s nothing worse than physical inactivity for preventing sleep. So on the day of a night flight, get up early and go for a run, visit a gym or swimming pool – your usual one or one in your hotel in you’re about to return home – or make sure you go on a long walk (around the airport if necessary). That way, your body will be naturally ready to sleep by the time you get on the plane. Of course, there is a slight downside to this; if you don’t actually get any sleep on your flight, you will arrive in your destination completely exhausted. Noise-cancelling is great, but what you listen to is just as important. Forget familiar music, and anything with words, which will only serve to keep your brain engaged. Instead go for more random, calming music; Ambient 1: Music for Airports by Brian Eno is good for relieving stress, but for actual sleep nothing beats the AirSleep app. It contains soundscapes from beaches and deserts, each with an underlying buzzy, bassy tone that rubs-out engine noise. You can even set it for however long you want to sleep for, with an optional alarm to wake you up. It’s like being in your own little world. If you sit near an aircraft’s wings where the engines are, the noise in the cabin can reach 80 decibels. Although it’s generally a constant, white noise, it’s the reason many people can’t sleep on aircraft. Cue active noise cancelling headphones or earphones, which are not to be confused with the much cheaper noise isolation earphones. While the latter merely have ear-tips that act as not-very-effective plugs, the former use microphones to detect the exact sound-waves, and electronically cancel them out. The end result isn’t silence, but it’s pretty close to it. There are many travel-friendly models around, with T3's favourite being the Bowers and Wilkins PX and Sony MDR-1000X. For more noise cancelling head phone recommendations, check out the Best noise cancelling headphones 2018: the answer to the noise of flying, travelling and people. While some flights are stiflingly warm, others are freezing cold, and you just never know what yours is going to be like. So dress for cold – and don’t rely on the puny blanket you’ll get on your seat. Start with a t-shirt, so you can strip down to just that if it’s a hot flight, but make sure you have a long-sleeved shirt and a hoodie or similar if it’s cold. A neck-warmer like the Buff Merino Wool is an excellent way to make sure you’ll be warm enough to sleep, as is a beanie hat or a baseball cap. Those free packs of eye-mask + socks + toothbrush are long gone from economy, but a simple eye-mask is so useful if you want to stay in control of your own light levels. Flight attendants like to dim the lights and bring them up to full to suit their own poorly thought-out schedules. Plus, it since it can take an hour for the food trolley to get to you after the lights go up. So why did they wake you up an hour too early? With an eye-mask, you can swerve this nonsense. If you really can’t stand the prospect of missing a meal, ask someone next to you to make sure you get served. Half-empty plane? 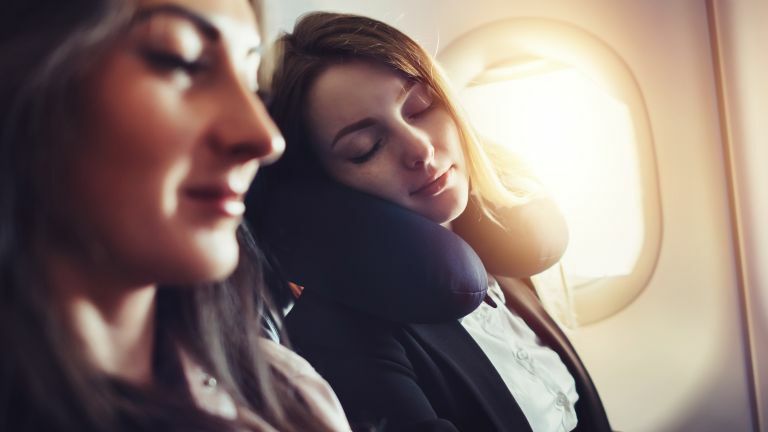 If you’re lucky enough to be travelling on a night flight with plenty of space, it’s likely that there will be groups of spare seats that passengers will pounce on to sleep across. Will it be you? Who gets these economy beds is down to one thing; timing. If you spot a row of three seats that are empty – or, indeed, any seat that you would rather have than the one you were assigned – move to it as soon as the plane's doors are locked. Just don’t make the ghastly mistake of doing so beforehand. If you do that, it's sod's law that someone will rush on to the plane at the last minute and march straight to your stolen seat, forcing you to do a walk of shame back to your original seat. Jet-lag can ruin any trip, especially a very long haul one, so try to get used to the local time in your destination as soon as possible. Your phone will automatically change to the local time when you land, but if you're wearing a wristwatch, set it to the time in your destination as soon as you board the plane. That way, your brain gets a head-start on your next timezone way before you land, and you can more easily judge when you really should be trying to sleep. If you travel often, then it may be worth investing in a GMT watch, like the Tudor Black Bay GMT above. GMT watches show two separate time zones at once. As any insomniac knows, making a plan to sleep can be the worst thing to do. So while it is sensible to think about how and when you’re going to sleep, it’s better to learn what works for you, then generally adhere to those habits. In short, once you’re onboard, just don’t think about it.